The first, and best film in the House series, is a schizophrenic movie that can’t decide between horror and humour. A horror novelist (Carrie’s William Katt) inherits a Victorian mansion, and finds that it contains the gateway to another dimension. 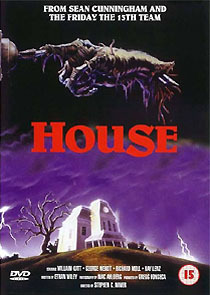 The second film features Ellen star Ayre Gross as another will beneficiary, lured to the house by the promise of hidden treasure. The third film is a sequel in name only, and is almost entirely unrelated. In it an executed criminal (Blade Runner’s Brion James) returns from the dead to stalk a cop (Millennium’s Lance Henriksen).